Posted on June 4, 2009 at 1:11 pm. 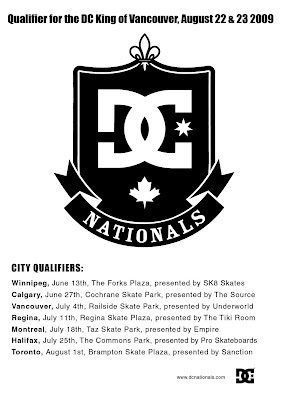 The DC Nationals Championship is the only nationwide skateboarding contest in Canada. The Source presents the Alberta Regional Qualifier June 27 at the Cochrane Skate Park. ALL SKATEBOARDERS can compete to qualify for the DC King of Vancouver August 22 & 23, 2009. Click here for the Registration Form. All contestants must sign a Waiver Form before competing.